This autumn stew of carrots, turnips, parsnips, onion, and plenty of spices is a vegetarian’s dream but satisfies even the biggest carnivore. Gruyère-topped croutons are not to be missed. I devised this tangy, chunky stew with vegetarians in mind, but it’s not only for them; in fact it should satisfy even the most voracious carnivore. I know this because I’m just a notch away from caveman-ship myself and it hits me just right. What it lacks in protein it makes up for with tantalizing spices such as cumin and coriander. You might not be familiar with millet because it isn’t well known in the United States. It is, however, almost as common as rice in Africa and Asia. And, guess what?—millet is available in your local supermarket. I promise. Head for the rice and grains section, find the more unusual grains like couscous, and look left, right, up, and down. Somewhere in there you’ll find millet. Buy a big bag because you’re going to love what it adds to recipes: a pleasing bite that’s just shy of a crunch, and a bit of starch that subtly thickens the liquid in which it’s cooked. If you like, you can use barley in its place but, because it takes longer to cook than millet, add it with the other ingredients in step four. 1. Thirty minutes before you want to cook, put the tomatoes in a bowl and season with salt and pepper. Set aside. 2. Heat the olive oil in a wide, deep, heavy-bottomed pot over medium-high heat until hot but not smoking. Add the carrot, turnips, parsnips, onion, and garlic and season with salt and pepper. Cook, stirring to prevent scorching, until nicely caramelized, about 15 minutes. 3. Add the tomato paste and stir for 2 minutes to coat the vegetables. Add the tomatoes and thyme and cook for 3 or 4 minutes longer. 4. Add the wine, white vinegar, and sherry vinegar, bring to a boil, and cook until nearly all of the liquid has evaporated. Add the bay leaf, cumin, coriander, and crushed red pepper. Stir in the vegetable broth and 5 teaspoons salt. Bring the liquid to a boil over high heat, then lower the heat and simmer, uncovered, for 15 minutes. 5. Add the millet, bring to a boil over high heat, then lower the heat and simmer for 30 minutes, or until the vegetables are soft and the millet is tender but still a bit al dente. If not serving immediately, let cool, cover, and refrigerate for a few days or freeze for up to 1 month. Reheat before proceeding. 6. 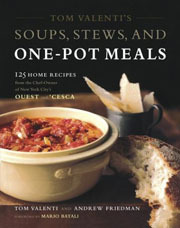 To serve, ladle some stew into each of 6 warm bowls. 8. Lay the slices of bread on a baking sheet and spread with butter. Broil in the oven until browned, about 2 minutes, then turn, butter the other sides and brown for 2 minutes. Top each slice with some cheese and season with salt and pepper. Place under the broiler until fragrant, about 1 minute. 9. If not serving immediately, let cool, cover and keep the croutons at room temperature for up to 2 hours. Reheat briefly on a baking sheet in a 220°F (105°C) oven just before serving. 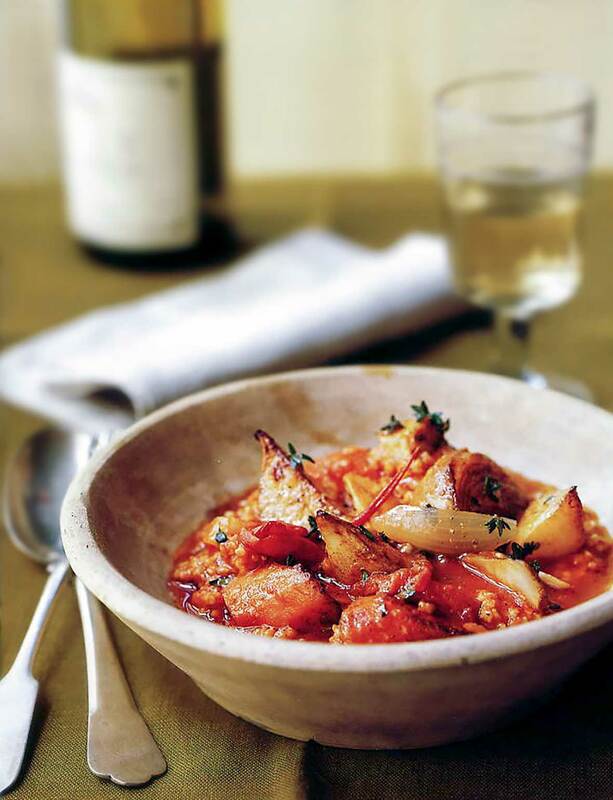 Autumn Root Vegetable Stew Recipe © 2003 Tom Valenti. Photo © 2003 Beatriz da Costa. All rights reserved. All recipes and photos used with permission of the publisher. How big is a small turnip? Hi ottawatony, a smallish turnip will be around 2 inches in diameter. Please let us know if you try the stew! I made this stew last Fall. I had the “most favorite” dish at the party. Yay Me, but the thanks go to the creator of this fantastic dish. I think it was rather warmish outside that day but none the less, I wanted to wrap up in my favorite sweater and light a fire. I am taking the recipe with me this weekend for a girls get away in the woods of southern Indiana. The weather forecast is for cool weather. I think you know what that means. Any suggestions for a wine pairing? Dessert? Hi again Sarah! I spoke to Natalie, one of our LC testers, and this was her suggestion. ” I would recommend a Gewurztraminer or Dry Riesling (white) or a Tempranillo (red) for this dish. There is some good crisp acid in the Gewurztraminer and Dry Riesling to balance the sweetness of the roots in the stew. The Tempranillo is full bodied red, but not so big it would overshadow the dish. For dessert? How about this blue cheese pear tart?